Stephan Viehweg, MSW, ACSW, LCSW, IMH-E®(IV), CYC-P is Associate Director of the Riley Child Development Center - Indiana LEND, a nationally recognized interdisciplinary leadership training program supported by the Maternal and Child Health Bureau and faculty member of the IU School of Medicine, Department of Pediatrics and the IU School of Social Work. 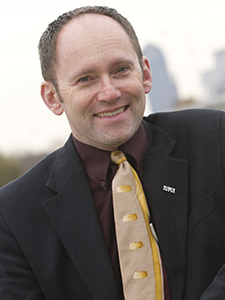 He also is Associate Director of the IUPUI Center for Translating Research Into Practice. His practice and research interest is in social-emotional development of infants and toddlers. He is founding chair of Infancy Onward (Indiana's infant mental health association) and Founding President of Family Voices Indiana. He serves a governor appointment and as Chair to the Indiana Behavioral Health and Human Services Licensing Board, and sits on the Board of Directors of the national Association of University Centers on Disabilities. He partners with a variety of state and local organizations and agencies to promote best practices for infant and toddlers. He is co-author of Tackling the Tough Stuff: A Home Visitor's Guide to Supporting Families at Risk. Steve's experience as a social work provider with families and their children with delays as well as adults with disabilities, and his ability to communicate in Spanish and American Sign Language, make him a well-respected, sought after therapist, presenter, and consultant.